How does a billing service help your problems? Medical billing services have undoubtedly helped solve a lot of problems for medical practices who had to spend countless hours on solving problems related to insurance companies, clearing houses, rejected claims, claims processing and patient data. With the help of medical billing services, the practices do not need to make a huge effort in securing their payments and ensuring their cash flows stay regular. They can outsource their billing department to experienced medical companies who, for a small fee from their collections, can help the practices file claims, process them, secure payments and then transferring them to the practice account. A similar process for in-house billing could take up to months to process but with the help of this service, physicians and practices can now secure their accounts receivables in just over two weeks. Billing companies manage your revenue cycle efficiently, thereby giving you better control to you over your financial position and decision making. In addition to this, they also help you resolve any possible conflicts with your claims and in case there are any rejections, the billing companies will ensure that they are resubmitted and you receive payment for that. Since the billing services receive their service charge based on your collections, they will always make sure that your collections are maximized. Other features of a medical billing service include recovery of your old accounts receivables, patient demographic entry, charge entry, insurance follow up and customized management reports. Without a shadow of doubt, medical billing services solve majority of your problems related to billing while you can sit back and relax and have your staff do something that is more important: patient care. It is about time you outsource your billing service to an experienced vendor. You will surely see a marked improvement in your revenue cycle management. The last few years have been monumental for the healthcare in the US. With the introduction of the American Reinvestment and Recovery Act (ARRA), the government laid down the foundation for a new structure in order to improve healthcare delivery. EMRs have always been on the forefront, taking most of the fire. The government along with numerous healthcare professionals believes in the value of healthcare automation. However, EMRs are merely facilitators while physicians are still responsible for delivering quality healthcare. With an estimate of $6600 in healthcare costs being spent on an individual per annum, the effectiveness of the ARRA is instrumental in re-shaping the future of healthcare. “The government cannot afford any hiccups. We are all too far invested in this for it not to work.” comments a healthcare IT executive. “$6600? I don’t see it. Where is it going? You step out right now and look around you tell me if you can spot one individual that had 6600 spent on their health, one individual.” remarked a construction worker from New Jersey, during an independent survey. The Meaningful Use requirements provide an effective road map for delivering quality healthcare. 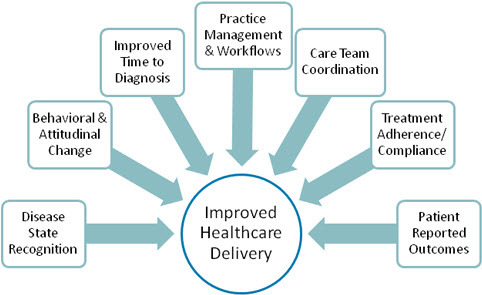 Its objective is to ensure that physicians learn how to effectively utilize EMRs and improve healthcare delivery. CMS introduced this exercise to help physicians realize what an EMR is capable of and how it adds to their care quality. Likewise, the Affordable Care Act reforms have resulted in better EMR adoption rates. The government believes that there is at least $300 billion to be saved through standardization of health information technology. However, despite the expected benefits, there is still lot of skepticism surrounding EMRs. Many physicians believe that EMRs in fact do not add to practice productivity, but instead slow them down while increasing their overheads. In a recent study by Danny McCormick and David Bor of Cambridge Health Alliance and Stephanie Woolhandler and David Himmelstein of CUNY School of Public Health indicated that EMRs may actually increase the frequency of tests ordered by physicians. More than 28,700 of patient visits and nearly 1,200 doctors were surveyed to determine the outcome. The study shows that physicians utilizing EHRs were 5% more likely to order imaging, rather than doctors who did not. Danny McCormick believed that it was important to point out the contrast of the actual findings with the commonly constructed belief of EMRs decreasing health costs. However, he went on to state that it is attributable to the enhanced interoperability provided by EMRs that doctors can expect to get results faster and can easily view them on their screens. The EMR is a technology that compels change and as long as it is resisted, its potential will remain muted. The EMR technology has come a long way since its inception. Starting as a simple tool for recording information, EMRs today assist physicians through decision support systems. EMRs are increasingly becoming an integral component of the healthcare system in the US. The adoption rates have doubled during 2008-2011. However, this increase is still short of the expectations of industry experts. As the world of technology evolves around us, expectations from an EMR continue to grow. “Most physicians today want a system that is easy to use and makes documentation quick.” says a health IT executive. “Physicians never liked documentation, even when it was on paper. But now with EMRs, they expect that computers will do most of the job as they interact with patients.” quoted another. Technology makes our lives more convenient and EMR serves this purpose for the healthcare community by expediting clinical workflows and seamless exchange of information. Research has shown that physicians have been able to save up to 30 minutes per day with EMR for documentation. However, some physicians insist that EMRs should offer even greater value. According to a recent study by the HSC, the expectations of the healthcare policy makers on improved coordination of patient care through EMR and the actual experiences of clinicians are quite different. The study available at the Journal of General Internal Medicine indicates that EMR interoperability is not well developed for interaction between physicians across different practices. Physicians believe that it would be difficult to meet the proposed meaningful use stage 2 objectives with the current capabilities of their EMR solutions. ONC is also planning to release new certification criteria once the final rule is out. Established EMR vendors are already working on their interoperability extensively to comply with the proposed regulations and remain competitive. EMR solutions will continue to evolve over time. However until a time that an EMR solution satisfies the requirements of each and every physician, is it really wise for physicians to dismiss the advantages of an EMR solution? EMRs have been proven to optimize practice workflow and reduce overheads but physicians and other end users will have to meet their respective EMR systems halfway to reap the true benefits of EMR technology.